We know that pursuing a master’s degree can be overwhelming, particularly for students who work full-time and are already balancing professional and personal commitments. We also know that every student has a unique reason that drives him or her to return to school and complete their degree. Last fall, we held a scholarship competition and asked our students to tell us their story — their why — behind their decision to enroll in a graduate program. This series will profile our scholarship winners. Read Part 1 of #WhatsYourWhy Wednesday here. Graduate Professional Studies: I’m here with Kristin Cataquet, a student in our Master of Science in Strategic Analytics program. Congratulations on winning our first “What’s Your Why” scholarship! Go ahead and introduce yourself. Kristin Cataquet: Thank you! My name is Kristin Cataquet. I’m from Washington D.C. but currently live in Boston. GPS: How many courses have you taken with GPS so far? KC: I have taken six courses, and I’m taking two this semester. GPS: Wow, you’re almost done! KC: Yes, and I am very excited about that! GPS: Tell me more about what you do for work. KC: I am a quality data analyst at Keurig Green Mountain, the single-serve coffee brewer. My responsibilities differ by the hour. I often work with engineers and leadership; looking at different analytical models to gain insight and make better decisions for our company. GPS: What made you want to go back to school to get your graduate degree? KC: When I was moving to Boston, I realized that a lot of the jobs that I was applying to preferred candidates with master’s degrees. 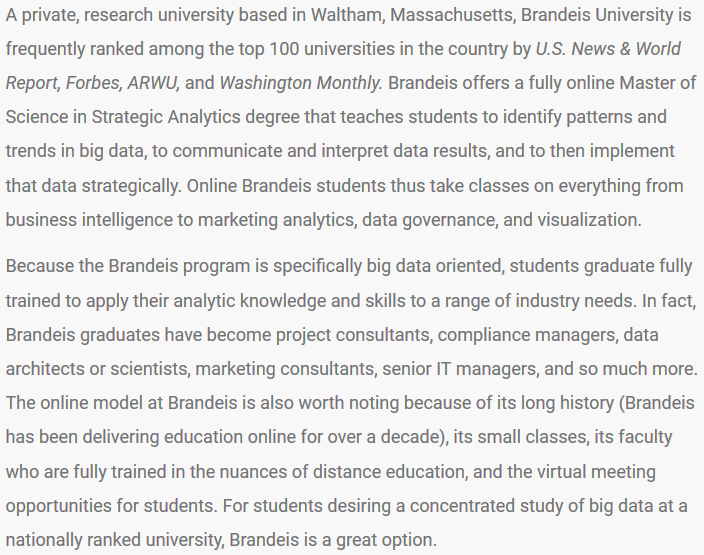 I decided to do some research and see what kind of graduate programs are out there, and Brandeis came up. I travel a lot for work, and Strategic Analytics was one of the only programs that offered the subject matter I wanted while still enabling me to do my job the way I need to. At first, I was just looking for that graduate school check mark. But since starting classes and even before then, I started to realize that I really do enjoy bettering myself and becoming better every day. GPS has really helped me fulfill that want and that need. GPS: That’s great to hear, and it also segues into my next question: what made you choose Brandeis over the other schools you considered? KC: It was a combination of the online nature of the program, the availability of the instructors and just the overall coursework. I took an online class during undergrad and felt like I did not learn anything and was under-challenged. But it’s a completely different story at GPS. The program is incredibly challenging, and I find it awesome and effective in terms of learning and retaining the information because while you’re partially self-teaching, you have guidance. You have the advantage of studying subject matter that is as high-level or low-level as you want. That option is necessary for students in analytics, where every job and company is different. You want to learn as much as possible in as little amount of time to make yourself more valuable. GPS: What else do you hope to get out of this program? KC: I work in a company where analytics is a relatively new field, and a lot of the higher-level employees in our department have left. 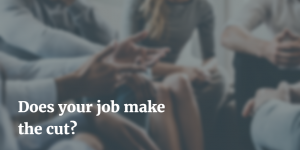 This has given lower-level employees the opportunity to lead the way, and it would be great to be able to do that accurately and effectively. So, my goal is not necessarily a promotion, but to feel more confident in my own abilities and what I’m capable of doing. I’ve learned that I really do love what I do. It’s kind of like figuring out that you’re a really good soccer player and then pushing yourself to become a professional soccer player. I’ve realized that I’m good at this, but I want to be really good at this. GPS: Speaking of soccer, what are some of your hobbies outside Keurig and the classroom? KC: Besides my full-time job, I work part-time at my old company. Outside of that, I probably play volleyball four times a week and my husband and I do a lot of salsa dancing. We love to hike and we love to travel. GPS: Is there anything else you want to tell us about your experience with Graduate Professional Studies? KC: When I came into the program, I really thought it was going to solely focus on analytics — that I would learn tools about modeling and other new skills. And that’s partially what’s happening. But there is also a whole other level to the program that’s surprised me: it’s learning about leadership, being a good employee and being a good boss. It’s learning to conduct yourself more professionally, building communications skills, and changing your approach to how you view a company. I didn’t necessarily know that I needed those types of skills, but all of the sudden, even after just my first term at Brandeis, I’ve realized I know so much more about my company and how it operates. It has been really rewarding to not only acquire skills on the technical level but on the leadership and professional level as well. “My specific interest in predictive analytics is the ability to merge the once vacant silos of health information into a model which engages a person into the maintenance of a healthier lifestyle. Genomics and health information technology has the potential to help predict disease before it becomes chronic. Predictive analytics will allow us to change from a treatment oriented to a preventive oriented healthcare system contributing to the efficiency of healthcare. Predictive analytics gives the foundation for an individual to step onto a healthier path in life when substantial knowledge supports the first step. There is a survival instinct which takes place in every individual when faced with the loss of health or life, giving them a fearlessness to assume responsibility to preserve their health and life. The key element of a healthier population is engagement and implementation of a program which improves health. For example, if a person has knowledge from predictive analytics showing they would have a 98% probability of being a candidate for colorectal cancer, then the barriers of fear currently existing in our current health care system would inspire the patient to seek preventive care. No one should die of colorectal cancer in this country or in the world. Getting the patient to have a CT Colonography (CTC) would decrease the mortality rate for colorectal cancer substantially. The cost of a CTC due to just the volume would decrease into the $250 range. The current cost at our facility is $495; it costs us $200 to have the CTC read through teleradiology by a radiologist who reads these studies frequently. Predictive analytics could change the whole landscape of CTC cost by pure volume. Radiologists who are not reading CT Colonography (CTC) now would learn how to read them and would become experienced because of the increase in volume. It is my hope that predictive analytics is steering healthcare back to the “doctor-patient relationship” of a patient driven healthcare. It is my belief that patient driven healthcare is the most efficient and effective way of providing health to a population. With the aid of predictive analytics, the robust information gained from predictive analytics data will enable a society to engage in healthcare, which would educate the population with knowledge as to how to predict their health outcomes. Thus, the future patient population would embrace preventive health. With patients engaged in their health, predictive analytics could reverse the current wasteful trend of 80% of healthcare expenditures being spent on 20% of the population, to one that is healthier for the economics of a country and a population. I could see in the future where 70% of the healthcare dollars is spent on 100% of the population with the remaining 30% going to research and development in healthcare and predictive analytics. Predictive analytics would reverse the 20 to 30% of profits now going to health insurance companies into increased health dollars invested into healthcare. A great example is William McGuire from United Health Care who earned $1.2 billion in one year. This should be a light to the world that the $1.2 billion which William McGuire made did not go back into the healthcare system; it went into his pocket to spend and donate where his personal interests lay. To put it in perspective, $1.2 billion could open 925 doctors’ offices each being 7,000 square foot for a cost of $1,297,400 each or 4.8 million CTCs reimbursed at $250 each. A key component to predictive analytics is the unbridled sharing of information. With quantum cryptography and the recent efforts of quantum computer (such as D-Wave), we are on the edge for sharing and processing healthcare’s “big data.” Predictive analytics in the United States will be a new frontier for all health information which is electronically collected around the world. With predictive analytics, a combination of pharmaceuticals used to cure a chronic disease in one area of the world will enable population health to take steps in preventive care in advance of the chronic disease in other parts of the world. Davis Graham is currently earning his M.S. in Health and Medical Informatics with Brandeis University, Graduate Professional Studies. Davis is the Executive Director & CFO at the Manatee Diagnostic Center in Florida. This essay won a contest for free entry into Eric Siegel’s Predictive Analytics World Conference. Emerging technologies have unlocked access to massive amounts of data, data that is mounting faster than organizations can process it. 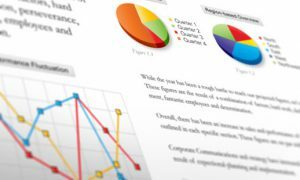 Buried under this avalanche of analytics are precious nuggets of information that organizations need to succeed. Companies can use these key insights to optimize efficiency, improve customer service, discover new revenue sources, and more. Those who can bridge the gap between data and business strategy will lead in our new economy. Big Data’s potential impact on enterprises and industries as a whole is boundless. This potential is already being realized here in the Hub. Boston has been ahead of the curve when it comes to Big Data, thanks to our unique innovation ecosystem or our “Big Data DNA,” the Massachusetts Technology Leadership Council says. As a result, Boston is home to an especially high concentration of Big Data startups, but also powerhouse industries that have strategically leveraged analytics and transformed the space. Check out how data and analytics has changed these five Boston industries. In our age of online marketing, marketers have access to mountains of data. Pageviews, clicks, conversion, social shares…the list is endless. That doesn’t even account for the demographic data marketers collect and interpret every day. These analytics have enabled marketers to access a more comprehensive report of campaign performances and in-depth view of buyer personas. Armed with these insights, marketers are able to refine their campaigns, improve forecasts, and advance their overall strategy. Big Data also enables targeted marketing, a crucial component of today’s online strategy. You know those eerily accurate advertisements on your Facebook page? You can thank Big Data for that. Analytics have unlocked enormous potential for marketers to better create, execute, and forecast campaigns. 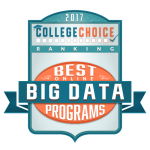 As a result, Boston has boomed with organizations entirely devoted to providing data-driven marketing solutions. HubSpot and Jumptap have emerged as leaders in this space, raising about $2.5 billion combined. Attivio, Visible Measures, DataXu are also leading marketing solutions providers. It shouldn’t surprise that healthcare represents a top industry in Boston’s Big Data ecosystem. The healthcare industry collects and analyzes enormous volumes of clinical data on a daily basis. Partners Healthcare alone has some two billion data elements from over six thousand patients, according to the Massachusetts 2014 Big Data Report. Big Data’s impact can be seen first and foremost with the electronic health record. Big Data has launched the electronic health record into the twenty-first century, revolutionizing patient care, and empowering the success of companies like athenahealth based in Watertown. “The meaningful use of electronic health records is key to ensuring that healthcare focuses on the needs of the patient, is delivered in a coordinated manner, and yields positive health outcomes at the lowest possible cost,” the report said. The space has expanded even more since Massachusetts passed legislation requiring all providers to adopt electronic health records and connect to the health information exchange, Mass HIway in 2012. The Shared Health Research Informatics Network (SHRINE) is another local innovation linking five hospitals (Beth Israel Deaconess Medical Center, Children’s Hospital Boston, Brigham and Women’s, Massachusetts General Hospital and the Dana Farber Cancer Center) in a centralized database to improve efficiency and quality of care. After genomic data and patient data from electronic medical records, medical devices like pacemakers or a Fitbit, for example, are the fastest-growing sources of healthcare data. All of these rich sources of information can – and are – being leveraged by Boston healthcare providers to improve care and lower costs. The State of Massachusetts and the City of Boston lead the nation with a sophisticated public sector approach to data and analytics. Governor Patrick made Big Data part of policy, launching Massachusetts Big Data Initiative and supporting Mass Open Cloud Initiative, a public cloud that utilizes an innovative open and customizable model. In 2009, the Commonwealth launched the “the Open Data Initiative” inviting the public to access the government’s data library from nearly every department. But analytics’ impact on the public sector is only beginning. Big Data can significantly improve the quality and efficiency of city services, and do so at a lower cost. But most importantly, data will unlock the future of urban living. Imagine if we knew the location of every bus, train, car, and bike in real-time? Imagine if we knew the profiles of every city building? This is the vision of Boston’s future as a “connected city” outlined in Mass Technology Leadership Council’s 2014 report Big Data & Connected Cities. Walsh has shown support for a data-driven, connected city and plans to hire a City of Boston Chief Digital Officer to help make this vision a reality. Big Data is a big reason Boston has evolved as a leader in the energy industry. Tapping into Big Data yields much more comprehensive, accurate reports of energy usage and also illuminates how these building can operate more efficiently. As a result, the industry has boomed with companies helping buildings go green to save green, including local leaders EnerNoc, Retroficiency, and NextStepLiving. Buildings in Boston and beyond are being constructed or retrofitted with building automation systems – cloud-based, centralized control centers – which collect massive amounts of data, report on energy consumption in real-time, and can continually adjust building performance for optimum efficiency. This “smart” living is the wave of the future and entirely driven by Big Data. Financial services is the fifth largest vertical for Big Data in Massachusetts. Big Data has made it possible to analyze financial data sets that previously weren’t accessible. Financial analysts now can examine and interpret unprecedented amounts of information and do so in new and innovative ways. For example, stock traders can collect and mine mass amounts of social media information to gauge public sentiment about products or companies, Information Week said. Top companies Fidelity Investments, Pricewaterhouse Coopers, Baystate Financial, LLC and others in Boston’s financial services sector heavily depend on big data to compile reports, forecast market future, and guide their decisions. Brandeis Graduate Professional Studies is pleased to announce our 2014 Commencement speaker for the Rabb School of Continuing Studies Diploma Ceremony, Eric Siegel, PhD. Eric completed his undergraduate degree from Brandeis University in 1991, and subsequently earned his PhD from Columbia University. Eric is the founder of Predictive Analytics World and Text Analytics World. He is the Executive Editor of the Predictive Analytics Times, and he makes the how and why of predictive analytics understandable and captivating. Eric is the author of Predictive Analytics: The Power to Predict Who Will Click, Buy, Lie, or Die and a former Columbia University professor who used to sing to his students. He is a renowned speaker, educator, and leader in the field. He has appeared on Bloomberg TV and Radio, Fox News, BNN (Canada), Israel National Radio, Radio National (Australia), The Street, Newsmax TV, and NPR affiliates. Eric and his book have been featured in Businessweek, CBS MoneyWatch, The Financial Times, Forbes, Forrester, Fortune, The Huffington Post, The New York Times, The Seattle Post-Intelligencer, The Wall Street Journal, The Washington Post, and WSJ MarketWatch.